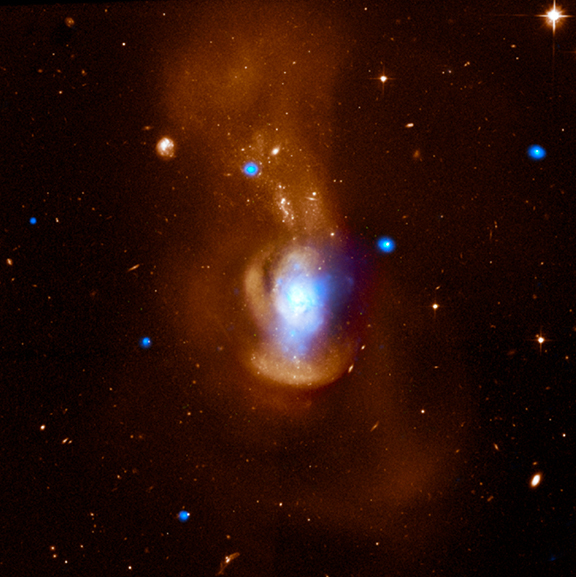 This composite image of the Medusa galaxy (also known as NGC 4194) shows X-ray data from NASA's Chandra X-ray Observatory in blue and optical light from the Hubble Space Telescope in orange. Located above the center of the galaxy and seen in the optical data, the "hair" of the Medusa -- made of snakes in the Greek myth -- is a tidal tail formed by a collision between galaxies. The bright X-ray source found towards the left side of Medusa's hair is a black hole (rollover the image to view). Most bright X-ray sources in galaxies are binaries containing either stellar mass black holes or neutron stars that remain after the supernova explosion of a massive star. Because these compact objects can generate X-rays for much longer periods of time than the lifetime of their massive progenitor stars, X-ray binaries may be used as "fossils" to study the star formation history of their host galaxies. 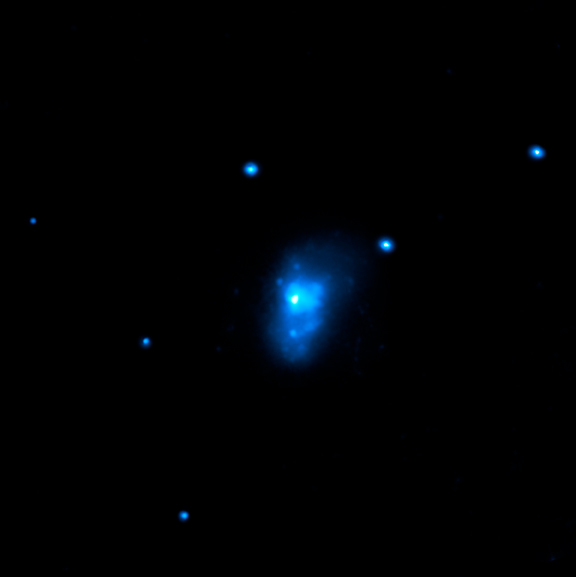 In this Medusa image, the X-ray binaries are seen as the bright blue point-like objects. A recent study of the Medusa galaxy and nine other galaxies measured the correlation between the formation of stars and the production of X- ray binaries. A key feature was to study this correlation for the Medusa galaxy and NGC 7541, two galaxies with particularly high star formation rates. It was found that both the number of bright X-ray sources and their average brightness were related to the rate at which stars formed. This work may be useful for attempts to use X-ray brightness to measure the rate of star formation in galaxies at very large distances. It was also found that for every one million tons of gas that goes into making stars, one ton gets pulled onto a stellar mass black hole or a neutron star. This result may help create more accurate models of the formation of X-ray binaries. Credit X-ray: NASA/CXC/Univ of Iowa/P.Kaaret et al. ; Optical: NASA/ESA/STScI/Univ of Iowa/P.Kaaret et al. Coordinates (J2000) RA 12h 14m 09.5s | Dec +54° 31´ 37"
if only I could understand... it's so difficult, too big for a simple mind like mine, but thanks for trying it.